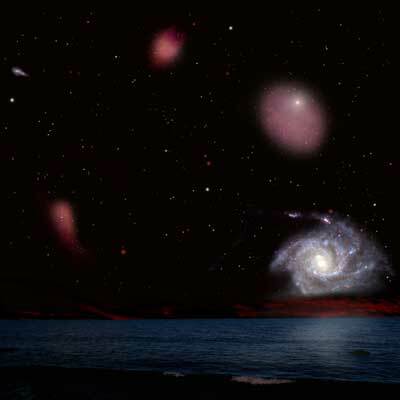 Galaxies In The Early Universe - Universe Galaxies And Stars Section. Galaxies in the early universe came in every flavour. It appears that Galaxies in the early universe didn't evolve at similar speeds or in the same ways. Almost right from the beginning, the universe was filled with Galaxies large and small, dusty and clear, active with star formation and relatively sedate. Researchers from the US used Infrared Array Camera (IRAC) aboard NASA's Spitzer space telescope to study Galaxies 10-12 billion light-years away. Instead of finding a similar set of galaxies, they turned up tremendous varieties, as much as we see in the night sky today. What did the universe look like when it was only 2 to 3 billion years old? Astronomers used to think it was a pretty simple place containing relatively small, young star-forming galaxies. Researchers now are realizing that the truth is not that simple. Even the early universe was a wildly complex place. Studying the universe at this early stage is important in understanding how the Galaxies near us were assembled over time. Jiasheng Huang (Harvard-Smithsonian Center for Astrophysics) said, "It looks like vegetable soup! We're detecting Galaxies we never expected to find, having a wide range of properties we never expected to see." "It's becoming more and more clear that the young universe was a big zoo with animals of all sorts," said Ivo Labbé (Observatories of the Carnegie Institution of Washington), lead author on the study announcing this result. Using the Infrared Array Camera (IRAC) aboard NASA's Spitzer Space Telescope, the Astronomers searched for distant, red Galaxies in the Hubble Deep Field South-a region of the southern sky previously observed by the Hubble Space Telescope. Their search was successful. The IRAC images displayed about a dozen very red Galaxies lurking at distances of 10 to 12 billion light-years. Those Galaxies existed when the universe was only about 1/5 of its present age of 14 billion years. Analysis showed that the Galaxies exhibit a large range of properties. "Overall, we're seeing young Galaxies with lots of dust, young Galaxies with no dust, old Galaxies with lots of dust, and old Galaxies with no dust. There's as much variety in the early universe as we see around us today," said Labbé. The team was particularly surprised to find a curious breed of Galaxy never seen before at such an early stage in the universe - old, red Galaxies that had stopped forming new stars altogether. Those Galaxies had rapidly formed large numbers of stars much earlier in the universe's history, raising the question of what caused them to "die" so soon. The unpredicted existence of such "red and dead" Galaxies so early in time challenges theorists who model Galaxy formation. "We're trying to understand how Galaxies like the Milky Way assembled and how they got to look the way they appear today," said Giovanni Fazio (CfA), a co-author on the study. "Spitzer offers capabilities that Hubble and other instruments don't, giving us a unique way to study very distant Galaxies that eventually became the Galaxies we see around us now." The study will be published in an upcoming issue of The Astrophysical Journal Letters. This press release is being issued in conjunction with the Observatories of the Carnegie Institution of Washington.